The Tree of Eternity (sometimes called the TOE or TOE Tree) is the rarest tree species on the island, as well as the most mysterious. Ever since the island was colonized, there has been no growth, no deaths and no seedlings from the trees. Experts believe the trees are thousands of years old but don't understand how they even multiply. They believe that due to the number of trees and their age, there must be some type of phenomenon every few centuries that spark new life. The tree seems immune to disease, weather and even fire within reason. 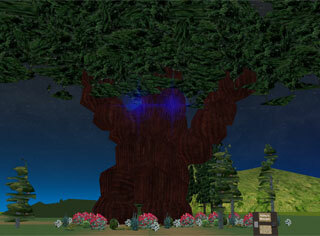 Some believe they are direct spawn of The Great Willow which resides in Ilexus Forest. Grimmwood Forest: Contains a blighted TOE. Kithicor Forest: Houses Kithu's Weeper, the most well-known TOE tree on SW Island. Also houses a few smaller ones as well.